This latest book in the series, following the fortunes of the Kydd and Renzi characters, is also available as an eBook. The author has already broken the mould for fictional stories set in the Nelsonian era by striking out into the rush for Empire era that was to become the strong feature of the Victorian age. DESCRIPTION: This latest book in the series, following the fortunes of the Kydd and Renzi characters, is also available as an eBook. The author has already broken the mould for fictional stories set in the Nelsonian era by striking out into the rush for Empire era that was to become the strong feature of the Victorian age. An amazing story for such a small group of islands off the coast of Europe and their modest population. This is really the second story in this new era, but follows seamlessly on from the stories set firmly in the wars with France and the great victory at Trafalgar. Enthusiasts of the Kydd and Renzi stories will not be disappointed in this latest tale. Their characters have matured but are still capable of surprises and the revelation of new depths. The pattern of fortunes and misfortunes has been maintained, holding the reader’s attention to the final word. Once again, the author’s painstaking research has been repaid in bestowing the story with a feel of authenticity. The characters continue to develop and show new aspects. Once again Renzi’s pursuit of Kydd’s sister has to be put on hold although his literary ambitions have been allowed to progress. Perhaps in the next story we will find out if he has achieved fame and fortune as a writer and won the hand of Kydd’s sister. The story is this time set in South America and this breaks new ground. The British involvement in the process of South American independence from Spain has received remarkably little attention in fiction or non fiction. Following Trafalgar the Royal Navy was free to support a rapid expansion of Empire. As seen in the previous Kydd and Renzi tale, the British expedition to Cape Province succeeded in establishing the British foothold in Africa, strengthened the sea route to India and Australia, and established a bridgehead for further development of Empire in Africa and elsewhere. From that new bridgehead, an expedition was sent to the River Plate to exploit the Spanish weakness after Trafalgar and assist what was believed to be a growing independence movement. Although the expedition ultimately failed, it lit the spark of revolution and British seamen contributed to that fight for independence, most notably with the fleets of Chile, Peru and Brazil commanded by sailor and one-time MP, Admiral Cockrane, that ended in the independence of new South American nations that had formerly been provinces of the Spanish and Portuguese colonies. The author has taken this framework and woven a very credible and absorbing tale for his well-established fictional characters. There is every evidence that he is enjoying the new freedoms offered by the years after Trafalgar. In the process, he will win new readers and they will want to go back to the start of the stories, which is always good news for a publisher. For the future we must wonder if Kydd will achieve Flag rank (this seems likely because the author has described the series as Kydd’s journey from pressed man to Admiral, but is by no means assured), in a series of tales that explore the largely untold story of British sea power in the post Nelson era when the Empire was being expanded by risk takers and traders, rather than by a deliberate political programme. Generally, literature has written off the period from 1805 to 1914 for the stories of sailors and this is such a waste because it is a period without major global war, but a time of enormous change and the continuing development of the Royal Navy. Between 1805 and the War of 1812, there is a wealth of incidents and campaigns and the French continued to maintain and deploy squadrons of warships, and independent commerce raiders, even though their navy had been comprehensively defeated and unable to sail a fleet in contention against the British. For the loyal fans of Kydd and Renzi, this new story is a great annual event, marking the passage of another year, and providing a further twelve months to guess where the next story will be based. Since the start of the tales, there have been many changes in publishing. The author has established his own website and publishes an interesting monthly newsletter. This is a great service for fans and for new readers. Hodder & Stoughton have also launched both a hard back volume and an eBook which should further expand the dedicated readership. It will be interesting to see how this effects the paperback edition, which usually follows the hard back edition. Traditionally, a book has been published in hard back as the premium edition, to be followed by a low cost edition in paperback that has then sold in volume and been reprinted. Dedicated fans of the Kydd and Renzi tales will buy the hard back and value it with the earlier stories. The eBook reader can still not replace the pleasure of seeing a line of much loved books on a shelf, to be read and read again over the years. However, the launch of hard back and eBook together will contribute to changing buying patterns and the low cost edition may become a PrintOnDemand edition that is available alongside hard back and eBook. Where this takes us has yet to be seen. 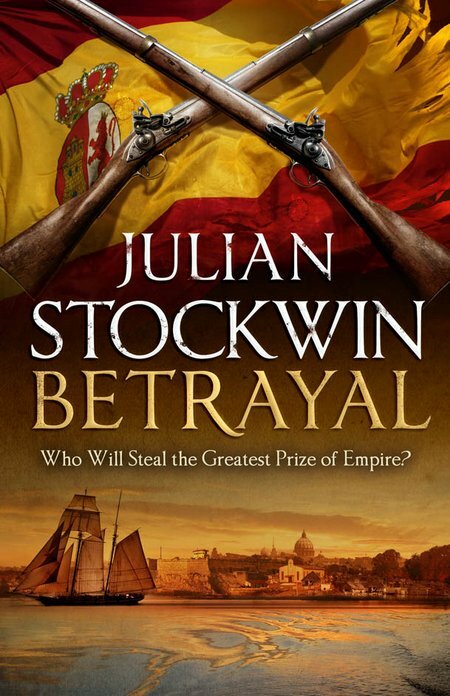 Julian Stockwin began his stories at a time when the only way to reach a large readership was via traditional publishing that was tied closely to the Spanish practices of the printing industry. This required the development of a distribution system of warehouses and bookshops and the author could expect only a small percentage of the cover price of a book, with a lion’s share going to cover production, storage, and distribution costs. Today, the eBook market is now established and follows a different pattern without the need for book repositories to hold stock, or lengthy periods to get the typescript into bound volumes at the end of the print production line. When an author is established, maintains a web site that can sell books and other products, and has learned the craft of writing, it is difficult to see where the traditional publishers will go. That affects new writers who have yet to learn their trade because it may be that the traditional publishing process of employing editors to guide the writer and tune the copy will cease to exist. Cost to readers will fall dramatically, and electronic storage of books will mean that large libraries can be held on a tiny card plugged into a small light-weight eBook reader that is able to handle many electronic formats and display in full colour in any light conditions. We are already relatively close to achieving this. It is a great technical advance but it has overlooked the needs of those who create the product. When reviewing a book like “Betrayal”, the fear exists that a well-crafted and well-produced book such as this may soon be a thing of the past as video costs continue to fall and similar freedoms extend to video production where an author’s creation is interpreted and presented as light entertainment in condensed form to fit a life where we graze information and suffer an increasing deficit deficiency. We are becoming accustomed to assuming that the technological pace is fast and getting faster. That is true to an extent, but the Phillips innovation of the eInk display took many years to be adopted into eBook readers like the Kindle. Its huge contribution was that it required very low power levels and worked by reflection of light, as does a traditional printed page. The alternative display, which can handle full colour, projects light, therefore being vulnerable to external light, such as strong sunlight, making the display unreadable. It also consumes much more power and provides a battery life of hours rather than the days life of an eInk screen eBook reader. So far there is no full colour innovation to match the single colour eInk display, meaning that we are some way off from having a long life, full colour display that works well in strong sunlight.